Brisbane Archbishop Mark Coleridge has welcomed a move to build stronger parish links with the indigenous community by adopting a new reconciliation plan (RAP). The RAP is a living document that identifies priorities and key goals in building awareness of Aboriginal and Torres Strait Islander culture, and strengthens relationships between Aboriginal and non-indigenous people across the archdiocese. “I am very keen that there be action to try and take the next steps on a long and difficult journey of reconciliation,” Archbishop Coleridge said. 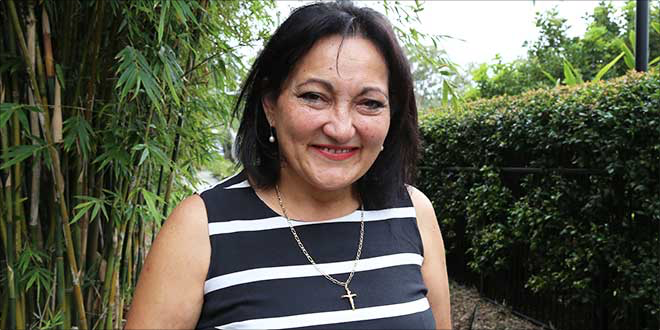 A document, developed by the Brisbane Archdiocese RAP working group, which includes the Murri Ministry’s co-ordinator Ravina Waldren (pictured), was presented to Brisbane’s clergy attending their annual convocation on April 6. “As Catholics, we often speak about the sacrament of Reconciliation in the context of forgiveness and ‘saying sorry’ for harms that we have done to others,” Ms Waldren told the meeting. “Reconciliation is about acknowledging historical injustices and disadvantages that the Aboriginal peoples have suffered since colonisation. Ms Waldren described the RAP as a significant step in the right direction towards healing for Brisbane archdiocese. “Parishes are at the heart of the Church’s mission and what you do to promote reconciliation in your parishes is vitally important,” she told priests. The RAP includes recognising indigenous cultural protocols – “welcome to country” ceremonies performed by elders, acknowleging traditional owners of local parishes and communities, naming the traditional land custodians in commemorative plaques, and ensuring indigenous flags are flown in parish grounds and schools. It also includes increasing indigenous employment opportunities across the archdiocese, and introducing cultural competency training for clergy, staff and key archdiocesan personnel. Ms Waldren said the RAP “provides an exciting opportunity to build and strengthen relationships” with indigenous people across the archdiocese. “Pope Francis reminds us that the culture of Aboriginal and Torres Strait Islander people is precious, with much to offer the Catholic Church around the world,” she said. Archbishop Coleridge said the Church must act on its message of healing towards indigenous people. “Unless we really do something that makes a difference … this is going to remain a running sore at the heart of the nation,” he said.